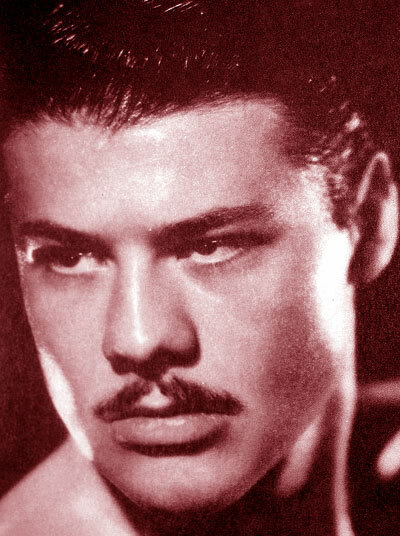 Turhan Bey, best remembered for being featured along with Maria Montez and Jon Hall in a number of Technicolor “Easterns” at Universal in the '40s, died in Vienna on September 30. Bey, who had been suffering from Parkinson's Disease, was 90. Turhan Bey was born as Gilbert Selahettin Schultavey on March 30, 1922, in the Austrian capital. His father was a Turkish diplomat; his mother was Czech Jew. According to reports, in 1940 Bey and his family fled the Nazis to the United States. In Los Angeles, he was discovered by a Warner Bros. talent scout. Bey's Warners stint didn't last long, as he began appearing in Universal productions shortly after his Hollywood career kicked off in 1941. Though never a star, he was a popular player in the '40s, in escapist Technicolor fare such as Arthur Lubin's White Savage (1943), with Maria Montez, Jon Hall, and Sabu; Lubin's Ali Baba and the Forty Thieves (1944), with Montez and Hall; and John Rawlins' Sudan (1945), once again with Montez and Hall. Among Turhan Bey's other movie credits were the serious, black-and-white war/family drama Dragon Seed (1944) at MGM, playing Chinese opposite the likes of Katharine Hepburn, Aline MacMahon, and Walter Huston; the color fantasy Night in Paradise (1946), with Merle Oberon; and the by now low-budget, black-and-white Song of India (1949), with Gail Russell and Sabu at Columbia. After his Hollywood career petered out in the early '50s, Bey returned to Vienna, where he worked as a photographer and, at times, stage director. He is supposed to have inherited a large sum as well, being able to live off of that in later years. Bey returned to Hollywood in the '90s, guesting in a handful of television series among them Babylon 5 and Murder, She Wrote. At that time, he also appeared in three low-budget releases according to the IMDb: Healer (1994; featuring a very young Tobey Maguire), and two movies directed by Stella Stevens' son, Andrew Stevens, The Skateboard Kid II (1994) and Virtual Combat (1995). In 2007, a great-looking Turhan Bey – along with Luise Rainer, Nancy Kwan, Christopher Lee, and others – could be spotted in Arthur Dong's documentary Hollywood Chinese, discussing his performance in Dragon Seed. Five years earlier, Bey reminisced about his life and career in Andrea Eckert's 40-minute documentary Vom Glück verfolgt. Wien - Hollywood - Retour. Turhan Bey was never married. His remains were cremated on Oct. 8.